In White House Briefing Room, New Seats For Associated Press, Fox News, NPR : The Two-Way NPR had applied for the seat previously occupied by columnist Helen Thomas, vying against Bloomberg and Fox News. 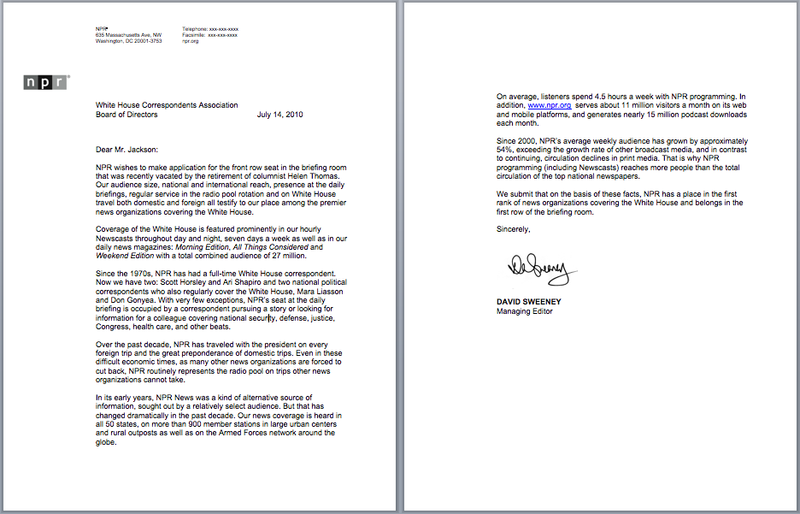 Ultimately, the White House Correspondents Association decided to give the seat to the Associated Press. 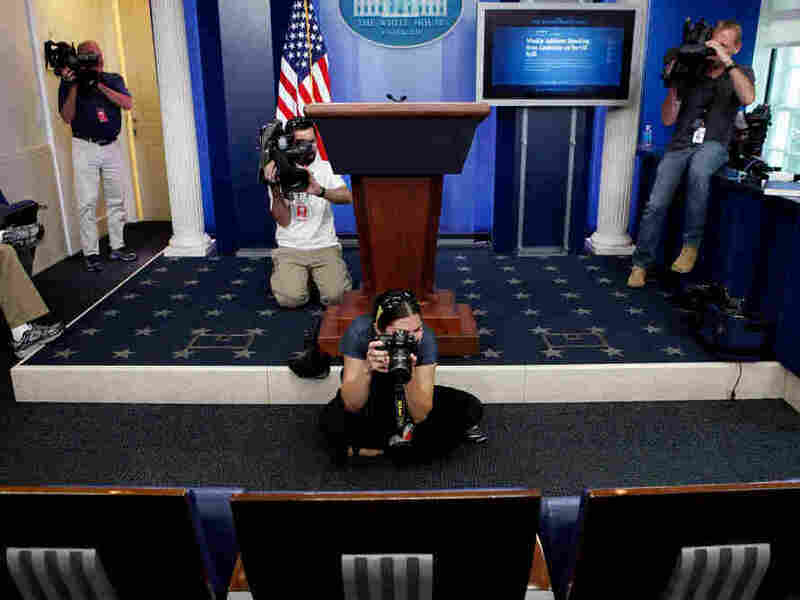 Journalists photograph the empty center seat on the front row of the Brady Press Briefing Room which was assigned to columnist Helen Thomas. Now, it will be occupied by the Associated Press. On Sunday, the White House Correspondents Association (WCHA) voted to reconfigure the seating chart for the James S. Brady Briefing Room at the White House. After columnist Helen Thomas retired, NPR was one of three organizations that vied for her front-row, center seat, making its case on "audience size, national and international reach, presence at the daily briefings, regular service in the radio pool rotation and on White House travel both domestic and foreign." Ultimately, the WHCA decided to affix an Associated Press placard to it. Fox News will move to the front row -- joining CNN, the broadcast networks, and the wire services. NPR will get a new seat in the second row, directly behind the AP. I asked Ron Elving, NPR's supervising senior Washington editor, why it matters where a White House correspondent sits. "Where you sit in the briefing room makes a palpable difference in how much access you have and how much attention is paid to your question," he said. "Everyone wants to be closer to the front so they can be more a part of the action and bring more to their audiences. We are no exception." During news briefings, the wire services usually get the first questions, followed by the major broadcast and cable networks. Although NPR didn't get the prime real estate, Elving said he is happy that correspondents Scott Horsley, Mara Liasson and Ari Shapiro will get to sit closer to the podium, and that they'll have greater visibility. We will be seen. We will have heightened involvement. In our new seat, we are flanked by The Washington Post, The New York Times, The Wall Street Journal and Bloomberg. This is a pretty good neighborhood.